We're trying to kick start the new year right by returning to some of our series that feature looks at miniature golf in non-competitive arenas. We're headed back into our piece that highlights the impact it can have on our communities in Part 8 of our "Bettering the Community" series. If you missed Part 7 last year, you can visit it here. We start this review with two articles that look how miniature golf has played an impact in a youth's life by helping him achieve the rank of Eagle Scout in the Boy Scouts. For those not familiar with the program or rank, to achieve Scouting's top honor an individual must plan and execute a community service project, leading other scouts and adults to accomplish the goal. (Editors Note: I'm also an Eagle Scout so have a great amount of respect for these projects and wish I had thought of this when doing my project!) The first story comes out of Texas (USA) where Jesse McMillan developed a miniature golf course at Texas Medical Center. The young man wanted to have an area where patients and their families could enjoy some fun while facing difficult and stressful times when getting medical treatment. The result was a six hole adjustable course and the article has a nice time-lapse video to watch the course being developed. 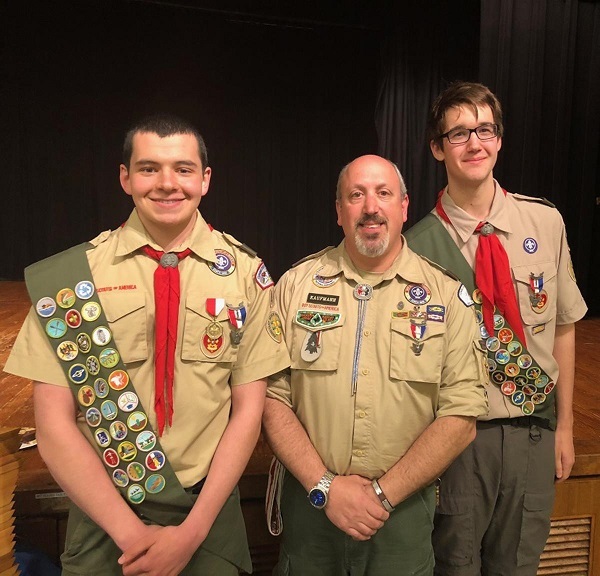 The second story is out of Connecticut (USA), where two young gentlemen recently earned the rank. Nicholas Levere's project involved the renovation and restoration of a local town's portable miniature golf course that has historic town buildings as its obstacles. (Editor's Note: I live close to that town and didn't even know they had a portable course - will have to try it out some time!) We hope to see this trend continue as there are many positive ways that miniature golf can impact a local community, so there's plenty of opportunity for young men and women to use it to achieve Eagle. Staying with the community theme, our next article is out of North Carolina (USA) and combines a bit of community come-together with artist based courses we have seen in the past. Bull City Mini recently ended their call for applications and is looking to have a pop-up course designed around local landmarks. They are looking to fill a green space in the city with the course an a bar for the spring and summer months. This follows a combination of trends as we've seen many art installation minigolf as well as locally designed community courses pop up in the past few years. You can read an interview we did with the team at A Couple of Putts who have been very involved with these types of courses here. Our next story is also out of North Carolina and involved sort of an inception of sports impacting the community. The group looking to develop the Boone Greenway Skatepark turned to miniature golf as a way to raise funds for their venture and develop this area for the community. There were sponsored holes, silent auctions and in the end the course itself donated the greens' fees that were paid during the event, enabling over $17,000 (~14,900 EUR) to be raised for this community project. Just goes to show a way that miniature golf can be used to help further the goals of other sporting communities. Our final article for this series part returns to Connecticut and shows the less physical impact miniature golf can have on a community. In September 2018, the Young Professionals of Waterbury Region held a miniuature golf networking event. (Editor's Note: While I didn't get to attend, The Putting Penguin did support the effort!). These event looked to put young professionals not only in touch with each other, but also potential employers or company contacts as companies were encouraged to send a representative to play or support the event. Providing the minigolf activity is a great way to not only showcase the sport but to also take some of the boredom out of a traditional networking event. The next step should be moving interviews to the minigolf course - we can start to rival golf a the sport of companies! We'll be back with more of these articles in 2019 and hope to have at least one if not 2 a month. If you have any ideas for articles (or want to help get them written) please reach out!